Having experienced an incredible trip to Sri Lanka and arriving back in the UK in March, Spring and my birthday month, happy days! Our holiday was amazing, the food utterly delicious and the people so warm and welcoming. More on this when I post a few recipes from my time working with a Sri Lankan chef. I love travel and I’m always saying to my other half how we should get better at taking off at the weekends to explore the great British countryside but we are not great planners. I’ve made a promise to myself – plan ahead! Whilst I adored the food in Sri Lankan I always crave something simple when I return from a holiday of indulgence. 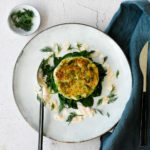 These smoked haddock fish cakes are easy to knock up and make a great Saturday lunch of an evening meal. They work well with hot smoked salmon or unsmoked fish too. Serve as I have with steamed spinach or a mixed leaf salad. Kids seem to love them too, minus the sauce! Cook the potatoes in a saucepan of boiling salted water until tender, approximately 15 minutes. Drain well and mash, set to one side. Meanwhile if you have a steam steam the haddock until just cooked through. If you don’t place in a deep baking tray with 4 tablespoons of water and cover with foil. Bake in a preheated oven 170C for 15 minutes or until just cooked through, this will depend on the thickness of the fillet. Slice the white part of the spring inions finely and sauté in a little butter until soft. Gently flake the fish and place in a bowl with the mashed potatoes, spring onions, herbs, capers, lemon zest and egg yolks. Add a generous twist of freshly ground pepper. Carefully stir with a fork, check the seasoning add salt if it needs it. Divide the mixture into 4 fishcakes. 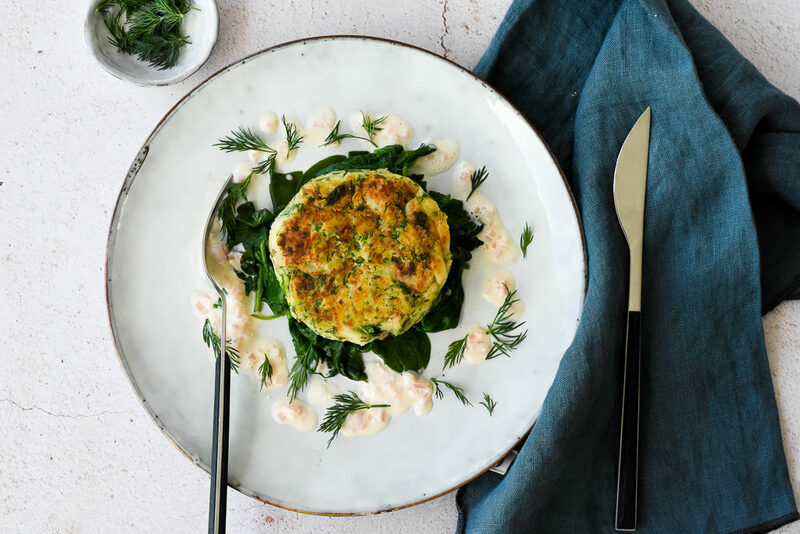 Set a frying pan over a medium heat and add the oil and butter, When the butter starts to foam add the fishcakes and cook for 5 minutes on one side then flip them over and place in a baking tray and bake in the oven on 175C for 10-12 minutes. In the meantime make the sauce. Put the wine, lemon juice, shallot and 3 tablespoons of water into a small saucepan, bring to the boil and simmer until reduced by half. Add the cream and simmer for a little longer, then lower the heat and gradually add the butter a little at a time whisking in-between additions. Reduce the heat to the lowest setting while you steam the spinach. In a large saucepan add a couple of tablespoons of water, bring to a simmer and add the spinach. Cover with the lid and cook for 2-3 minutes. stir and remove from the heat and drain in a colander. 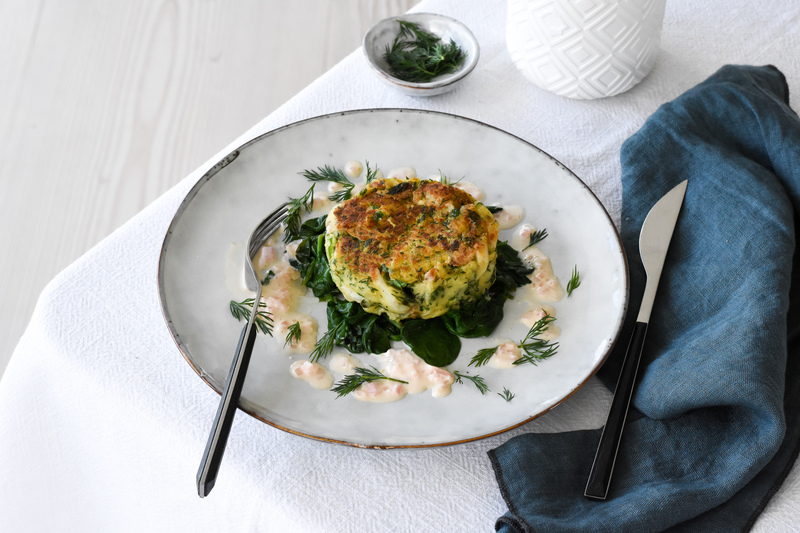 Place a little spinach in the centre of each plate, place the fishcake on top and spoon a little sauce on each plate, add the dill and serve.